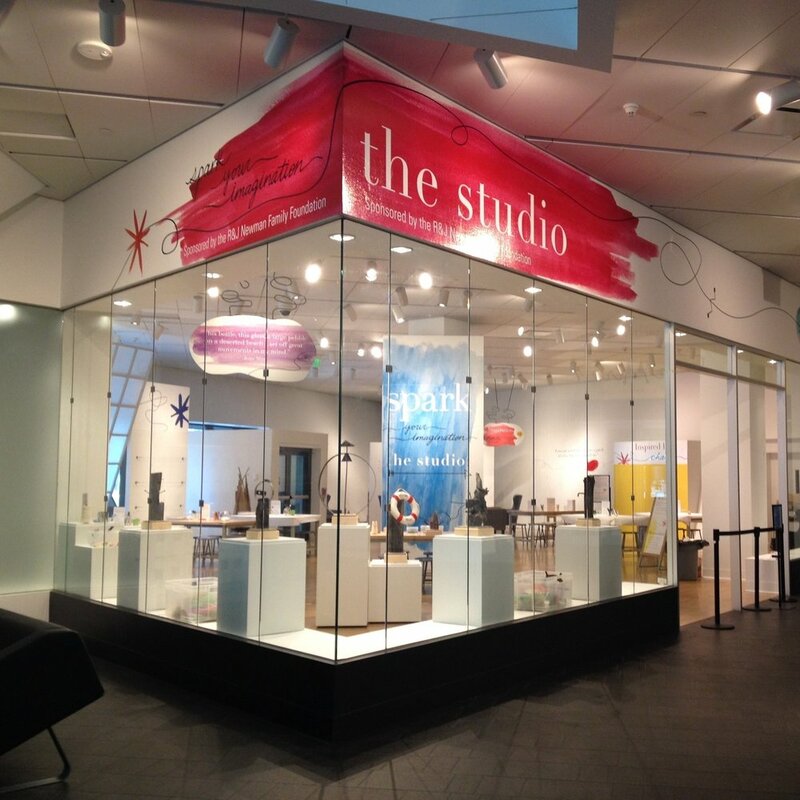 As an Interpretive Specialist at the Denver Art Museum, I specialize in the development of interpretive materials and programs for the museum’s modern and contemporary art and Native art collections and special exhibitions. This includes labels, audio guides, videos, and participatory experiences that encourage visitors to create, share, and connect with each other and the work on view. I also host community advisory committees, conduct visitor evaluations, train volunteer docents, lead gallery tours, and work with cross-departmental staff to deliver live programming related to the collection. This multi-sensory exhibition included a tactile moment at the entrance that incorporated materials similar to those Gibson used to make his artworks. 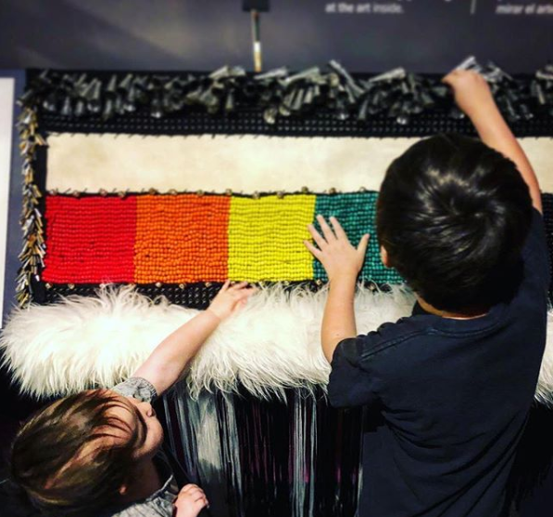 Visitors were invited to run their fingers over these materials to feel the many different textures, make the fringe sway, and hear the jingles. Inside, visitors enjoyed listening to a curated playlist by Gibson of songs that inspired him. This activity was developed as a way for visitors to respond to emotionally charged issues presented by the artists in this exhibition. Visitors were invited to share how the work made them feel by leaving behind a colored bead that represented an emotion in a test tube at selected works of art. They were also able to see the reactions of others and view the work with a new perspective. This lounge provided a space for visitors to contribute to larger conversations presented by the artists in this exhibition and to interact with one another via the prompt "I want to have a conversation about..." Visitors were invited to write a topic or to respond. It also included a conversational video of the artists responding to questions posed by community members. This interpretive zone explored some of the key moments throughout time that inspired Mark Bradford's work (the Civil Rights movement, the AIDS epidemic, the LA Race Riots, Katrina, to name a few). This was done through images, but also through the artist's own words. These images put a figurative lens on Bradford's abstraction. In this space was also a 7 minute video interview with Mark Bradford. This 1950s inspired lounge offered visitors a more detailed look at the social and historical context to this exhibition, with an interactive element that allowed visitors to reflect and share their own stories, remembrances, and ideas about the period. The space included period inspired furniture, a jazz playlist, 1950s magazines, and photographs of the artists. This studio was located just outside of the exhibition Joan Miro: Instinct and Imagination. Inside, visitors were invited to "Spark their Imagination" with interactive activities that were inspired by Miro and his artistic process. In a short video, visitors could hear directly from the artist himself, as well as from several artists in the Denver Art Museum's permanent collection. The interpretive approach of this exhibition invited visitors to savor the experience of slow looking. The design employed vibrant walls, colorful rugs and plush couches that encouraged visitors to sit back and savor the details, indulging in each painting’s palette, vigorous brushstrokes and rich surface texture. Slow looking activities included creative writing, a listening station, and an audio guide that invited visitors to spend 6 minutes with a single work of art. 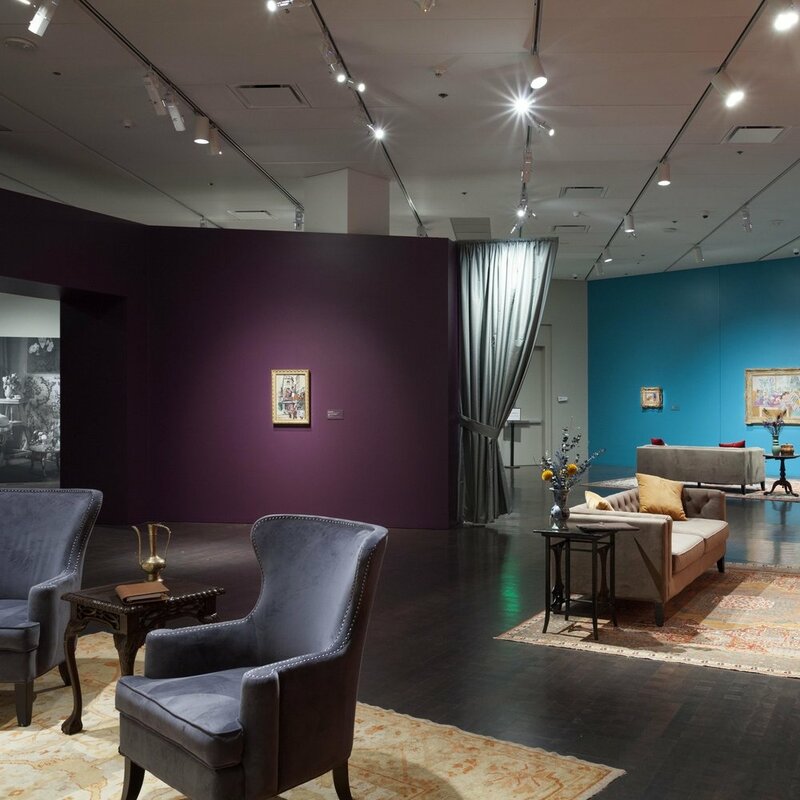 For select exhibitions at the Denver Art Museum, community advisory committees are organized to help shape our interpretive and programmatic elements, create resonances with local issues and perspectives, and act as conduits to community partners. I worked closely with contemporary artist Nick Cave on the implementation of HEARD*DAM, which was part of Denver's Biennial of the Americas celebration. For this performance, Cave collaborated with 64 local dancers to bring a herd of whimsical horses to life. Live music accompanied the performance, which can be seen here.